By Alexander Macdonald, Sub-Editor, North British Agriculturist, Edinburgh. Beyond vague tradition, we have no reliable indication of the origin of the blackfaced or heath breed of sheep. It is a common belief in Scotland that it is not indigenous to Britain, and many circumstances tend to confirm this opinion. Dr Walker, who is acknowledged to have been a high authority on the subject, supposes that it is of foreign origin, and that the forest of Ettrick was selected as its first locality in Scotland. He mentions that a flock of some 5000 sheep was imported by one of the Scottish kings for the use of the royal household, and from that stock the whole of the blackfaced race, it is supposed, succeeded. The opinions of other writers, however, combined with the natural character of the breed, indulge the belief that there is some truth in the conjecture that it originated among the mountains of Cumberland, Westmoreland, and Lancashire, and that it was introduced into Scotland at an early date. Some people hold, on the other hand, that the blackfaced sheep originated among, and were the earlier inhabitants of, the mountainous parts of the south of Scotland. There is no breed of sheep existing in Britain at the present time to which this breed bears much resemblance, and this, coupled with the fact that the only similar sheep known is Wallachian, goes to support Dr Walker's argument. The comparatively valueless character of the fleece, as well as the whole figure and general independent bearing of the blackfaced sheep, suggests, or in fact points it out, as the native of a high and stormy region. This peculiarity, says a writer, may in all probability have been derived from the character of the hills where the breed originated. The influence of the soil and climate on the covering of animals is well known, and has been strikingly exemplified in the natural history of the sheep in this and other countries. A humid atmosphere has the effect of lengthening the covering of sheep as well as of other animals. The cattle in the west coast have, as a rule, longer hair than those of the east, because of the dampness of the atmosphere. The depth and quality of the soil are also supposed to exercise a considerable influence on the growth and character of the wool and general development of the sheep. Notwithstanding the inferior quality of the wool, and other defects of this breed in its aboriginal and unimproved condition, its peculiar adaptability to withstand severe climate, and to fatten on the coarsest herbage, commended it to occupiers of large tracts of heath and mountain land; and to quote Hector Boethius, who wrote about the year 1460, and speaking of the sheep in the vale of Esk, says—"Until the introduction of the Cheviots, the rough-woolled blackfaced sheep alone were to be found." From this, it would seem that the blackfaced or heath breed of sheep had been the prevailing breed at an early date. After the introduction of the Cheviot and other fine-woolled breeds, it was supplanted by them in many districts, at different periods during its history-—a circumstance regulated by the prices of wool—but the race has never been allowed to die out. The germs of its early fame had never been entirely extinguished, and for many years past they have been gradually regaining strength. It is only within the past century and a half, or little more, however, since flockowners began to direct attention to the improvement of the breed, but during that time many defects have been removed. Since the advent of the present century, an enthusiasm has been manifesting itself among sheep farmers to raise the value of their flocks, and a healthy emulation has existed among breeders for upwards of sixty years. Their desire to resuscitate the faded popularity of their favourite breed has been vastly encouraged by the Highland and Agricultural Society and kindred associations, who at their annual exhibitions, give handsome premiums for the best specimens of the breed. It is a matter for regret, however, that the inducements held forth by these associations have not been more generally responded to. Only the small minority of the breeders have apparently become alive to the importance of devoting means and attention to the amelioration of their flocks. Foremost among the improvers have been the Messrs Gillespie of Lanarkshire; the Messrs Archibald of Overshiels; Mr Charles Howatson of Glenbuck; and Mr Foyer, Knowehead, Campsie. The Glenbuck stock is perhaps the oldest, having possessed a well-known reputation for upwards of a century. It has always been distinguished for its superiority of blood and excellence of type. Before Mr Howatson became owner, the grazing of Glenbuck was in the hands of the M'Kersies, who took a great interest in rearing sheep, and they acquired for their flock a name which will long have a familiar ring among breeders of blackfaced sheep. Mr Foyer, Knowehead, is owner of a very old and celebrated stock; while the flock of the Messrs Archibald, Overshiels, has long been regarded as a source of pure blood, and good breeding. A distinguished sheep farmer, writing to us on the subject of blackfaced sheep, likens them to the favourite tribes of black Polled Aberdeen or Angus cattle, thus—"I should say of the blackfaced sheep which are notable for their long standing and superior breeding, that the Glenbuck stock occupies the position of the ' Ericas,' and the Overshiels and Knowehead stocks the places of the 'Pridesè and 'Lucys.'" Other gentlemen who have aided in the improvement of the breed are Messrs Fleming, Ploughland, Lanarkshire; James Greenshields, West Town, Lanarkshire; T. Aitken, Listonshiels; James Craig of Craigdarroch; R. Buchanan, Letter, Killearn; J. Moffat, Gateside, Dumfries; P. Melrose, Westloch, Peebles; Thomas Murray, Braidwood, Penicuik; John Sloan, Barnhill, Ayrshire; James Duncan of Benmore, Argyllshire; William Whyte, Spott, Kirriemuir; Peter Robertson, Achilty, Dingwall; James A. Gordon, Udale, Invergordon; Donald Stewart, Chapel-park, Kingussie; and Mr Brydon, Burncastle, Berwickshire. I have to acknowledge my gratitude to several of these gentlemen for their valuable assistance, in placing at my disposal their observations and experiences in connection with the breeding and rearing of blackfaced sheep. Their communications will not only form an interesting appendix to my treatise, but they have served in confirming former opinions. Lanarkshire has from time immemorial been regarded as the nursery of blackfaced sheep, and this and other southern counties have played important parts in the resuscitation of the breed. Their annual sales have been valuable institutions for many years, and have been the mediums through which a great deal of excellent blood has been disseminated. Drafts of young tups from the best breeding stocks in Britain are disposed of at these sales, and the gradual increase of prices obtained for tups during the past quarter of a century, affords a good indication of the growing desire to procure pure blood and fashionable types. The great secret in keeping blackfaces is to avoid overstocking. The importance of this was sadly overlooked in the earlier history of the breed, but with the enlightenment of the past fifty or sixty years this disadvantage has been generally guarded against. The principal events of the year for breeders of blackfaced sheep are the Lothian ram sales, the Perth sales, and the autumn Falkirk trysts. At all these there is generally a good representation of the leading sheep stocks in Scotland, which country may be designated the home and fountainhead of the breed. The Lothian ram sale is an important event to breeders who go in for high-class stock, and we are pleased to note that these are year by year increasing in number. That they are increasing in number is well indicated by the fact, that the demand has been gradually becoming more active for many years, This fact has not been so forcibly demonstrated within the past few years, but from 1850 to 1876 there was a very remarkable improvement in the character of the tup market. The increased fastidiousness of flockowners in selecting highbred tups has been the means of bringing large prices into the hands of a few of the most enterprising and successful sheep breeders. The demand has been pressing for tups extracted from some of the flocks which I have previously mentioned, and the owners of these may be said to have enjoyed a monopoly of the trade. The rise in the prices of high-class stock within the past twenty-five years has been remarkable, and affords additional evidence of the desire now extant to produce an altogether finer race of sheep. Tups which were worth about £7 each twenty-five years ago—and £7 was considered a good price—would now bring from £60 to £70, while £20 each is not considered a very high price for well-bred rams. For ewe stock the demand has been less active, and consequently the advancement in prices of ewe stock has been less marked. Some thirty years ago, however, 25s. was regarded as a more extravagant price for a ewe lamb than 50s. or 60s. would be at the present day. The great advancement thus indicated in the prices of black-faced sheep has not entirely resulted from one cause. There have been several agents working with combined force in bringing it about. An important one of these agents has undoubtedly been the prevailing anxiety to improve the character of the blackfaced breed, whose natural characteristics are so well calculated to resist the hardships of a severe climate. This anxiety has long existed among a few flock-owners, but it has been gaming a hold upon the majority in recent years, and extending rapidly. The causes for this are not far to seek or ill to find. The revolutionary tendency of the wool market, and the meteorological severity of the past eight or ten years, have turned the attention of many admirers of finer woolled breeds to the blackface. In all industries the branches expected to yield most profit are generally pursued, and it is believed, if indeed not actually proved, that considering the scanty fare on which this breed subsists, and even thrives, Highland flocks are on the whole most profitable. What proves an obstacle to the development of pastoral pursuits in Scotland, however, is the large extent of deer forests. Fashion is the all-powerful agent which has been at the bottom of the mania for creating and extending these. It was estimated in 1873 that the number of sheep displaced by forests in Scotland was 400,000, while it has been computed that since then the number of sheep displaced has been raised to 481,550. The number of forests in 1872-73 was said to be between 60 or 70, and now, including those only partially cleared, the number is 96. Of these 96 forests there are 5 in Aberdeenshire, 6 in Argyllshire, 1 in Banffshire, 1 in Caithness, 5 in Forfarshire, 33 in Inverness-shire, 5 in Perthshire, 37 in Ross and Cromarty, and 3 in Sutherlandshire. The total number of sheep in these counties at present is about 3,363,414. Many experiments have been tried during the history of the Highland breed of sheep with a view to the improvement of its wool. These were conducted in various parts of the south and north of Scotland, by way of crossing blackfaced ewes with tups of other breeds, but the results have invariably been disappointing. The experiments tended rather to degenerate instead of improve the Highland breed. "Some time is required," says a sheep-farmer, "before the blackfaced stock can be restored to its natural purity after being crossed with tups of other breeds." Crossing blackfaced ewes with Leicester rams is a common practice among flockowners who fatten their young stock for the market. In these circumstances, such a course is justifiable and commendable, as it produces heavier and earlier-maturing lambs. The depreciation of the finer varieties of wool in the wool market arises from the fact that the demand is being supplied from other countries. The Cheviot and Leicester breeders are thus being undersold by their foreign competitors, and the breeders of Highland sheep would share the same fate, if the wool of the blackfaced sheep had not a speciality which adapts it for peculiar purposes. Its coarse, shaggy fibre is found to be more durable and serviceable in the manufacture of carpets and other rough textures than any other variety of wool. These figures show a great irregularity in the prices of wool, the result of the fluctuations being a very considerable decline during the past ten years. It will be observed, however, that in consequence of the cotton famine and American war in 1864, the prices of both classes of wool rose materially in value, and continued high till the end of 1867. Another ascendency took place in 1872, as a result of the Franco-Prussian war in 1870-71, but since then the variations have been less marked. The prices of Cheviot wool have been falling more rapidly than those of blackfaced sheep, which is shown to have been at as low an ebb as 7d. in some former years, but not within living memory has the price of Cheviot wool been so low as it now is (1883). In reference to this subject, Mr Aitken, Listonshiels, says—"Owing to foreign competition, wool has been selling very cheaply of ]ate, being nearly as low as it was fifty years ago, the difference being from 1d. to 2d. per lb. for wool of the best quality. Highland wool in some cases only brings 5d. per lb., while in 1864 the current price was as high as 1s. 3d.—more than double the present selling rate." "The sheep in this region are chiefly the old Scotch breed, with curling horns and crooked faces and legs, such as are represented in old pictures. The black seems to be spattered upon them, and looks as if the heather would rub it off. The wool is long and coarse, giving them a goat-like appearance. They seem to predominate over any other breed in this part of the country, yet not necessarily nor advantageously. A large sheep farmer from England was staying at the inn, with whom I had much conversation on the subject. He said the Cheviots were equally adapted to the Highlands, and thought they would ultimately supplant the blackfaces. Although he lived in Northumberland, full two hundred miles to the south, he had rented a large sheep walk or mountain farm in the Western Highlands, and had come to this district to buy or hire another tract. He kept about 4000 sheep, and intended to introduce the Cheviots upon these Scotch holdings, as their bodies were much heavier, and their wool worth nearly double that of the old backfaced breed. Sheep are the principal source of wealth in the whole of the north and west of Scotland. I was told that sometimes a flock of 20,000 is owned by one man. The lands on which they are pastured will not rent above one or two English shillings per acre; and a flock even of "1000 requires a vast range, as may be indicated by the reply of a Scotch farmer to an English one, on being asked by the latter one, 'How many sheep do you allow to the acre?' 'Ah mon,' was the answer, 'that's nae the way we counts in the Highlands; its how monie acres to the sheep!'" Cheviots were then, as already indicated, displacing the Highland breed in many parts of Britain, but since that time a very material change has taken place. Even the green mantled hills of the south are being more extensively put under blackfaces every year. "From the time of King James down to the year 1785," says Hogg, in his Statistics of the County of Selkirk, " the blackfaced or forest breed continued to be the sole breed of sheep reared in this district; and happy had it been for the inhabitants had no other been introduced to this day." The latter clause of Mr Hogg's remarks will, we have no doubt, be very freely re-echoed by many flockowners who have had the disagreeable experience of changing stocks, as the maxim of supply and demand required. A writer on the subject, in the year 1844, states that in the south of Scotland "Lord Napier made strenuous and successful exertions to arouse and direct the solicitude of sheep farmers to the improvement of the Highland breed. In the Vale of Ettrick he began con amove to take and to give lessons on sheep husbandry; and in 1819 he succeeded in forming a pastoral society, which since the date of its establishment has steadily and successfully directed the energies of the farmers." "So early as 1798," continues the same writer, "the majority of sheep walks in the south were stocked with Cheviots, but the old blackfaced sheep, in the rough character which belonged to it before the era of modern improvement, was some fourteen or fifteen years ago reintroduced to two or three farms in the county of Selkirk, but it has never reacquired favour, or been fairly tolerated, except where the less hardy whitefaced sheep is too fragile for the abrasions of the climate." The nature and habits of the blackfaced sheep are truly Highland. When left for a short time on the hills unmolested it becomes wild, and wherever depasturing during the day, it has the peculiarity of returning regularly to one particular spot over night. It seeks its bed on elevated ground, and it is both pleasant and interesting to watch its instinctive movements on the hillsides on a fine summer evening. About sunset it repairs to its sleeping ground, and in olden times it was regarded as a foretaste of good weather if the flocks moved early and heartily to their lodging places. The following are the points which pure-bred tups should possess:—Long-wool; evenly covered body, with a glossy or silky appearance; legs, roots of the ears, and forehead (especially of lambs) well covered with soft fine wool; the muzzle and lips of the same light hue ; the eye bright, prominent, and full of life ; the muzzle long and clean, the jaw being perfectly bare of wool; the ears moderately long; the horns with two or more graceful spiral turns, springing easily from the head, inclining outwards, downwards, and forward—the upper edge of each turn being horizontal with the chaffron; the carcase long, round, and firm ; the neck thick and full where it joins the shoulder; the shoulder bones well slanted; the limbs robust and chest wide; and the ribs well curved and full, wool coming well down on the thighs and chest; face and legs, if not entirely black, should be speckled, and the hind legs well bent at the hocks, and free from black spots or "kemps." The general figure of the ewe is the same as the tup, but the horns should be flat and "open," or standing well out from the head. Big-boned lanky sheep, with narrow chests and flat ribs, are generally of weak constitution, and these, as well as sheep with bare hard hairs on their legs, breast, neck, and face—which are far too common—ought to be got rid of. On these animals there is a great proportion of the wool "kempy," or full of hard white hair, and destitute of felting property. It is observed that sheep with strong or rising noses are generally hardier in constitution than those with weak hollow faces. The most objectionable point of the present race of Highland sheep is the inferiority of its wool. The average yield is as nearly as possible 4½ lbs. per hogg, 3½ lbs. per ewe, and from 4 to 5 lbs. per wether. The return, both in quantity and quality, varies in accordance with the nature of the pasture, soil, and climate on which the sheep are kept. A higher return is obtained in the south of Scotland than in the northern counties. Where the sheep are pastured on strong grassy land, the quality of the wool is finer than when they are confined to heathery pasture; but the latter gives an additional flavour to the mutton, which is a favourite commodity in the metropolitan markets. The females of the blackfaced breed are not so prolific as those of the Cheviot or Leicester breeds, there being as a rule a return of only one lamb for each ewe. It sometimes happens, however, that Highland ewes have two lambs, but in the majority of cases, or in fact in nearly every case, they give birth to and foster only one lamb. The number of ewes allotted to each ram varies with the different systems of management, but one tup has often been known to sire over 60 lambs. On the better farms in the south of Scotland the return of wool is considerably heavier than on the northern pastures, having been greatly improved since the pastures came under the management of the present tenants. As an instance of this, I may mention that in 1864, which was a fairly representative year, the average weight per fleece of ewes and hoggs on Mr Howatson's (Glenbuck) pastures, was 4½ lbs., whereas in 1875 it was 5½ lbs. ; in 1876, notwithstanding the severe season, it was 5¾ lbs., thus showing an increase of 40 per cent. in twelve years. Since 1876 this successful breeder has raised the average yield of wool per ewe and hogg to about 5½ lbs. Over the immense tracts of mountainland, which constitute a large proportion of the entire area of the United Kingdom, a very efficient system of pastoral farming has prevailed for nearly half a century. As early as the advent of the present century, many flockowners in the south of Scotland had begun to give a considerable amount of attention to the management of mountain pastures, and their good example ultimately extended to the remotest corners of Britain. Generally speaking, every large sheep farm is so situated that one part of it is best adapted for ewe stock; another portion is more suitable for hoggs; while the more elevated and barren parts are only fit for the rearing of wethers. One of the points of pastoral farming which has hitherto been greatly overlooked, and which is now beginning to claim the well-merited attention of farmers, is the drainage of hill pastures. This is not only the means of removing many dangerous streams, springs, and flat swampy bogs, which usually intersects mountain pasture, but it improves the quality of the grass, and prevents rot and other diseases which are fostered by wet land. Fencing sheep pasture is a practice not very extensively adopted, except on small farms where flocks are confined, and require the constant attention of a shepherd. Boundary fences are common in some parts of Britain, and these prove advantageous. It would be of much service if the practice of enclosing and dividing mountain farms was more generally pursued. It would afford accommodation for separating flocks as occasion required. On farms on which breeding is regularly conducted, parks are specially valuable, though they are not so common as they should be. Besides preventing sheep from straying, they afford special facilities for keeping tups and ewes separate, which becomes necessary at certain seasons of the year, and also for the weaning of lambs. The southern districts of Scotland claim the honour of raising the best stock, and as being the districts in which the spirit of improvement has been longest and most actively at work. In the counties of Lanark, Ayr, Dumfries, Selkirk, and Mid-Lothian, the greatest pains and attention have been bestowed on the breeding process for a long period. The northern counties, though at one time far behind in their production of stock, have been pulling up within the past twenty or thirty years. Farmers who had previously been groping in the dark, as to the "secrets" of successful breeding, have recently been showing inclinations to vindicate the honour of the Highland fleece. A most active system of (Highland) sheep farming now exists throughout the United Kingdom, and we have no doubt but, "with a long pull, a strong pull, and a pull altogether," farmers will yet acquire a much higher celebrity for their Highland breed. The selection of tups, and the "weeding out" of inferior females from the flocks, are now receiving a considerable measure of that careful attention which these points so strongly demand and so well deserve. Tups are generally put to the ewes from the 20th to the 30th of November,—according to the situation and character of the farm,—but it is a widely recognised rule on mountain farms that it is much better, both for the mother and the offspring, to have the lambing a little too late rather than too early. In the more northern and inland districts, flocks in the fall of the year are generally sent to be wintered in the low country or seaboard parts. The character of the winter on the hills is, as a rule, much more severe than in the low arable country, and the system of wintering keeps down the rate of mortality among Highland flocks. About 1860 the average price per head for wintering ranged from 2s. 6d. to 3s. 6d., but since then it has been doubled. Six shillings per animal is a common price now; and if a small extent of turnips is allowed along with pasture, 7s. 6d. or 8s. is sometimes obtained. Two reasons for this great increase in the expense of wintering may be put down thus. The first is, that owing to the increased value of the sheep, owners thereof in upland districts turn more of them to the low country than formerly, in order to get them as well wintered as possible. The second is, that many lowland farmers, who formerly let their winter pasture, now prefer either to keep sheep all the year round, or to buy them in to winter, with a view to sell in spring or through the summer season. Between the years of 1830 and 1840, the cost of wintering sheep was calculated at from 1s. 6d. to 2s. per head. Hoggs are usually put to the wintering ground about the 1st of November and taken home about the 1st of April. "This sum was considerably short of what was wanted for the landlord; and the only resources for the tenant, in order to enable him to make up the deficiency, and keep his family, was the keep of a few cows, and the growth of potatoes, but which, after all, would yield a very unprofitable return for the time employed and the capital invested. The rent, however, is now lowered, and the price of the wool considerably raised." In the southern counties of Scotland the flocks are seldom taken off the lower hills during the winter season. About Christmas the rams are withdrawn from the ewes, and fed upon turnips, hay, crushed oats, cake, &c. Flocks kept on hill farms during winter require the close attendance of shepherds, particularly during stormy weather. Despite the vigilance of the most trustworthy shepherd, the sheep—having a tendency to crouch in sheltered places, where snow when drifting is sure to accumulate—frequently become embedded in wreaths of snow. Heavy losses are sustained in this manner. One of the most striking characteristics of the blackfaced sheep is its endurance amongst snow. I have seen cases, during my experience of hill-farming, of sheep being buried under a wreath for six or seven consecutive weeks, and coming out alive after a thaw. Frequently, however, after being subjected to such prolonged confinement, they succumb to the elements after being set at liberty. The pasture on hill farms generally gets scant during the winter season, and it is found necesary to supplement the food which flocks gather on the hills by hay, straw, turnips, &c. When farmers send their sheep to be wintered in the low country, they are always careful to place them under the charge of trustworthy and faithful shepherds. For successful sheep farming a careful shepherd is the all-important functionary. In his description of the qualifications of a mountain shepherd, Mr Little says—"The shepherd should be honest, active, careful, and, above all, calm-tempered. A shepherd who at any time gets into a passion with his sheep, not only occasionally injures them, but acts at great disadvantage both in herding them and working among them. A good-tempered man and a close-mouthed dog will effect the desired object with half the time and trouble that it gives to the hasty passionate man. The qualifications of a shepherd is not to train his dog to running and hounding, bat to direct the sheep, according to the nature of the soil and climate, and the situation of the farm, in such a manner as to obtain the greatest quantity of safe and nutritious food at all seasons of the year. Those shepherds who dog and force their flocks, I take to be bad herdsmen for their masters and bad herdsmen for the neighbouring farmers." These remarks are to the point in every sense of the word, and cannot be too frequently impressed upon the minds of both shepherds and masters. At all seasons, interested shepherds can, by care and judgment, do a great deal in improving the condition of flocks. Most farmers take a quantity of turnips along with lowland pasture during the winter, and when the supply of grass falls short in the first of spring, the sheep are usually netted on the turnips. This is found to encourage the growth and muscular development of young stock. Ewes in lamb are sometimes also allowed a supply of turnips, but if they can be brought through without it there is less danger of mortality at the lambing season. When ewes, heavy in lamb, are kept upon such nutritious food, the growth of the horns of the male lambs becomes so stimulated as to frequently entail the death of the one or the other, or both ewe and lamb, during lambing. Lambs are often to be seen among Highland flocks as early as the 1st of April, but farmers have been taught some costly lessons in recent years, to guard against early lambing. The hoggs are put to the hills when taken home from the wintering, but breeding ewes are, as a rule, kept on dry ground near the farm steadings or sheep cots, in order that the closest attention can be given them during the critical period. It is customary, when practicable, to give a few turnips to ewes immediately after Lambing, and this enriches the supply of milk for the lambs. Tup lambs are castrated about the end of June, or when they are eight or ten weeks old. Clipping is begun among hoggs about the middle of June, and is generally finished about the second week of July. It is the custom on many farms to wash the sheep before clipping them. In the shearing operation mutual assistance is frequently given. Neighbouring shepherds help each other during the clipping. The sheep are generally branded on the horn or marked with tar or paint at clipping, while some farmers dip them immediately after the fleece is removed. The lambs are allowed to remain with their mothers until the end of July, when weaning begins. At this stage the lambs (but in some cases the wether lambs are not weaned till later on) are separated from the ewes and kept on clean pasture, usually preserved for the occasion, for at least a fortnight, out of hearing of their mothers. Commonly the "weeding out" process takes place at the weaning season, that is the singling out of inferior lambs, or technically speaking "shotts," which are then, or shortly afterwards, disposed of along with "cast" ewes. The age at which ewes become "cast" is, generally speaking, five years, but in exceptional cases they are sent to the market earlier. The prices of "shott" lambs vary from 8s. to 16s., while those of "cast" ewes range from 16s. to 24s. 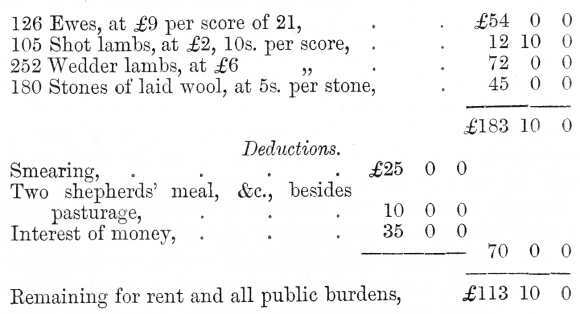 This year (1883) prices were several shillings a head over these sums. These are disposed of at the nearest market. Sheep farmers in the North and West Highlands are largely accommodated for disposing of their summer drafts by the Fort-William and Inverness sheep and wool fairs, and the Muir of Ord markets, while the Falkirk trysts and Lanark fairs are the chief emporiums of southern flockowners. Since so many extensive districts in the Highlands were cleared of men and black cattle and converted into sheep walks, immense flocks of blackfaced sheep—chiefly wethers—are annually disposed of at Doune and Falkirk trysts, and driven into the Lothians and England, where they are fed on turnips. A few flockowners, who have a lowland farm along with a large range of hill pasture, feed the wedder lambs on the lowland farm instead of selling them at weaning time, and dispose of them in the spring, or through the following summer. Practically speaking, so soon as the shearing and weaning are over and the sheep carefully marked, the ewes, lambs, and wethers are divided, if necessary, and disposed of according to the nature of the farm. The old and true proverb, that "shelter is half meat for sheep," is prominently kept in view, and shepherds are watchful to move their flocks to sheltered ground during stormy weather. During the past thirty years the practice of smearing, once so common on hill farms, has been to a great extent abandoned. Some farmers in the north, however, still smear their flocks. The great mass of flockowners prefer to dip their sheep, as will be learned from the opinions of the leading breeders subjoined. It is found to involve less expenditure, and be on the whole more profitable than smearing. Most farmers dip their flocks twice a year. This is regulated by the character of the pasture, whether wet or dry. On very dry pasture one dipping in the year is—at least for old sheep—sufficient. Lambs are generally dipped at weaning time, and again before being sent to the wintering. 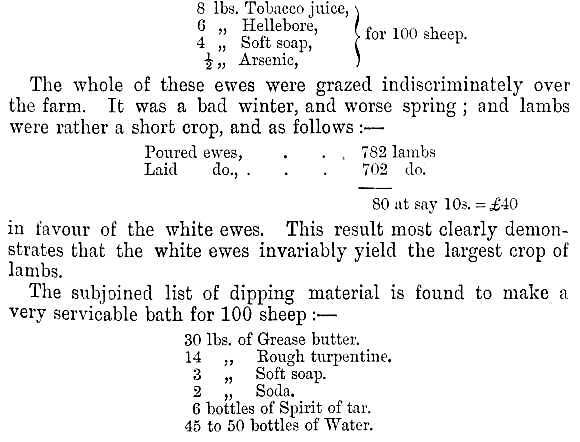 Besides the experiments tried with a view to the improvement of the blackfaced breed, some enterprising gentlemen have also made some progress in the direction of improving pasture land by draining and liming, &c. Mr Howatson made an experiment on his property at Dornel, in the parish of Auchinleck, some years ago, which is worth being recorded. He took two farms, which had been previously used for dairying purposes, into his own hands, and having drained and limed them, he put them under a regular breeding stock of blackfaced sheep. After a trial of some eight or nine years, however, the experiment proved unsuccessful and he abandoned it, and let the farms. He found that a sufficient number of sheep could not be kept to consume the grass, without the latter getting too foul from their droppings, and not having a portion of rough pasture to graze upon, the sheep lost a good deal of their hardiness of constitution, which is a very valuable feature of this breed; and, moreover, the sheep stock on such land, was not so remunerative as the dairy cows which had previously been kept upon it. The experiment, however, was not without its value, as showing that the class of land is chosen for each distinctive breed of stock which is best adapted for it. The flocks of this gentlemen are, as I have already indicated, of the highest and purest breeding. He gives and gets long prices for tups annually. In 1870 he sold a tup at £60, and in 1872 he purchased one at £50. Mr Archibald, Overshiels, has, in recent years, had the distinguished honour of obtaining the highest average prices at the Lothian ram sales. He sold two beautiful specimens to Mr Howatson, at £71 and £58 respectively in 1882. Besides the labour which smearing involves, it depreciates the value of the wool very considerably, and gives rise to the question, whether the benefit which the sheep derives from smearing is equivalent to the sacrifice in the price of the fleece by its application ? The average yield of wool from smeared and dipped sheep is as nearly as possible thus: Smeared—wethers, 6 lbs. to 7 lbs. ; ewes, 3½ lbs. to 5 lbs. ; and hoggs, 4 lbs. to 5 lbs. Dipped—wethers, 3½ lbs, to 5 lbs. ; ewes, 2½ lbs. to 4 lbs. ; and hoggs, 3 lbs. to 4 lbs. These figures show that to make up for the reduction in the value of laid or smeared wool, there is an increase in the yield or weight of the fleece over that of white wool. But out of this has to come the wages of the smearer and the cost of smearing materials, which together cannot be less than 8d. per head. Dipping is calculated to cost from 2d to 3d. per animal. Hints for the Improvement of the Breed. 1. Select the best woolled tups and ewes of the blackfaced breed, possessing the most fashionable type—which I have previously described—of bodies, heads, and horns, from flocks which are known to contain blood of the purest description, but avoid in-and-in breeding. 2. Having selected say, five, ten, or twenty ewes, which come nearest ideal perfection, mate them with tups coming as nearly as possible to the standard of excellence in every point. 3. Care should be taken that these and their produce be not allowed to pasture among the ordinary hill stock. 4. Care should be taken that the female progeny of the first selected lot be not allowed to come in contact with the tups until they are at least eighteen months old, at which time another tup will require to be selected, but not from the same source as the sire or dam of the gimmers had come. 5. This practice of getting a new tup for each succeeding race should be adopted until the flock would increase so as to permit a portion of the gimmers being sold. All inferior gimmers should be disposed of every year, as should also the whole of the ram lambs. 6. It is specially important that the pasture should never be overstocked, that the ewes should be kept in good condition during winter, and that the lambs should not be allowed to fall off in condition during and after the weaning season. Mr Howatson of Glenbuck gives it as his opinion, that the blackfaced sheep are increasing in number, and are deservedly becoming more popular throughout Scotland every year. The average yield of wool per animal on his farm is 5½ lbs. per hogg and ewe. It is a great mistake, says Mr Howatson, to smear sheep ; it should never be done, and no good farmer will persist in doing it. He dips his sheep twice a year, at a cost of about 6d. per head. The only way in which he considers the wool of the blackfaced sheep could be improved is by procuring the best blood for breeding purposes. Mr James Archibald, Overshiels, Stow, says blackfaced sheep farming is now more extensively pursued than it was ten or twelve years ago. 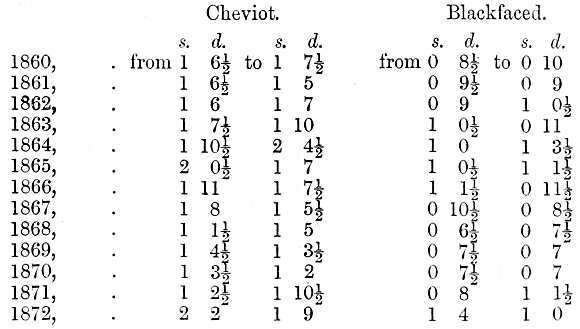 Cheviots were then the favourite breed in many districts, but in consequence of the very great reduction in the price of wool, combined with the effects of the recent bad years, that breed has greatly depreciated in the estimation of sheep farmers. It is actually dying out and giving place to the hardier blackfaced race. Writing to us on the same subject, Mr James Greenshields, West Town, Lesmahagow, says—"Between thirty-five or forty years ago the blackfaced sheep were very much supplanted by Cheviots, but a reaction has again taken place, and the blackfaced breed is rapidly being re-established. As early as the first of the present century, almost every flock of blackfaced sheep was smeared, but now smearing is all but unknown. In this district the yield of wool per ewe is from 5 lbs. to 6½ lbs., the yield per hogg being 1 lb. more, which is about the average of other southern districts. Smearing cannot be done at anything less than 8d. per head." Mr Greenshields has tried some experiments in the crossing of the blackfaced with other breeds. He has used Yorkshire, Lincolnshire, and Border Leicester tups to black-faced ewes with little success. He preferred the produce of the Leicester tup, however, to that of any of the others, as they matured more rapidly, were earlier ready for market, and fed on scantier fare. In this district, says Mr Aitken, Listonshiels, and in the south of Scotland generally, sheep farming is far more extensively pursued than it was fifty years ago. Blackfaced sheep have been increasing in popularity during the past quarter of a century. Their fine hardy constitution enables them to withstand the severity of the winter and backward summers better than any other breed. The Cheviot and other breeds are dying out in Scotland. There is most money to be taken out of black-faced sheep when properly managed, and in recent years blackfaced sheep farming has been more remunerative than in earlier periods. South country farmers have become alive to this fact, and more attention is now being bestowed on the breeding and rearing of young stock. The average clip on Mr Aitken's farm is 5½ lbs. per animal. Smearing is not practised in his neighbourhood. He dips his sheep once a year, either in the month of February or October. His lambs are always dipped at weaning time. The cost of dipping is about 13s. per 100 sheep, or 2d. per head. On soft grassy pasture the quality of wool is always better than on hard heathery land, but there is great room for improvement in any case. It cannot be improved, however, by crossing the blackfaced with other breeds, without impairing the hardiness and natural characteristics of the Highland breed. The tups used on all kinds of pasture should have strong shaggy coats, entirely free from "kemps." The wool must not be short and curly, but, on the contrary, long and straight in the staple. Mr Aitken considers that the best way to improve the wool of the Highland breed is to select the best ewes, whether deficient or not in wool, and mating them with good hardy well-bred tups. This invariably gives rise to a stock of capitally woolled lambs. Crossing blackfaced sheep with other breeds, says Mr Aitken, has always a detrimental effect, and after introducing strange blood into a flock, it is several years before it can be reduced to a state of purity. Mr J. Moffat, Gateside, Sanquhar,Dumfriesshire,says—"Black-faced sheep at one time, within the past thirty years, threatened extinction by the growing interest shown in the Cheviot breed, but winters have been so severe in recent years, that the mortality amongst the latter mentioned variety has been so great as to necessitate restocking of farms with the blackfaced or heath breed, whose hardihood is better calculated to withstand rigorous climates. In this part of the country it is now threatening to be overdone." Sheep farming, says Mr Moffat, could be made to pay better by increased liberality on the part of the landlord in renting farms. The average yield of wool per animal in this district is about 5 lbs. Mr Moffat holds that there is no profit in smearing sheep, but on farms where this is practised the average outlay per head is about 9d. He dips his own flock twice a year, using arsenic and carbolic acid, which cost about 4s. per 100 sheep. A gentleman who has been singularly successful in improving the quality of the wool of his large and superior flock of black-faced sheep is Mr Robert Buchanan, Killearn. He has also by careful attention greatly raised the character of his flock ; and besides having won many distinguished prizes in agricultural shows, he has obtained high prices for his shearling tups. Not later than the month of June last, he sold a lot of shearling tups to Mr Malcolm of Poltalloch, Argyllshire, at £20 each. The only means, he says, of improving the type of the blackfaced sheep is by careful selection from the best stocks, and he would suggest the following as the points which a good sheep should possess:—Strong bone, a good face, well laid-in shoulder, well set on nice short legs, wool free from "kemps," and coarse hair. He has during the present year (1883) sold hoggets about eleven months old at 51s., and he says 45s. is quite a common price when well fed on turnips and grain. These are extensively bought in by low country farmers to feed instead of crosses, as they cost generally about 10s. a head less than grey faced lambs. There has been no smearing in this part of the county, says Mr Buchanan, for the last twenty years. As a general rule, it is found that dipping answers equally as well as smearing, and is much cheaper. Dipping can be performed with half a pound of grease at say 3d., and dip and men's wages, say 2d.—5d. in all for each animal; while smearing would cost as much as 1s. a head. He dips his lambs at weaning time, and again at the 1st of November, when sending them away to the wintering. Hill ewes are dipped once a year, generally in the end of October. Mr William Whyte, Spott, Kirriemuir, corroborates the remarks of other authorities regarding the popularity of the breed, and mentions the counties of Lanark, Dumfries, Ross, and Inverness specially in which the Cheviot breed is being supplanted by blackfaced sheep. The amount of sheep pasture, however, says Mr Whyte, which has been put under deer has greatly curtailed the extent of sheep farming. It has not been paying so well as could be desired of late, owing to the low price of wool and the cost of wintering. The latter expense has been doubled within the past thirty years. Wool is selling at half what it realised some twelve years ago. The clip of well-wintered wethers averages from 5 lbs. to 7 lbs., while that of ewes is from 4 lbs. to 5 lbs. Smearing is not practised in this county. Mr Whyte dips his lambs when they are weaned in August, and again in the 1st of October before sending them away to the wintering. The wool of the blackfaced sheep, Mr Whyte continues, can only be improved by selecting fine woolled tups of the same breed, without tampering with crossing. Crossing might be the means of temporarily improving the wool, but thereby the type and hardiness of the sheep would be destroyed. Mr Gordon, Udale, Invergordon, concludes that the most efficient way to secure and conserve the best qualities of the blackfaced sheep, as well as to eradicate its defects in a proper and satisfactory manner, is by careful and judicious selection. He has tried various crosses, and bred them back to the pure heath breed again, but without success. The tups used in crossing were those of the Leicester, Lincoln, and Cheviot breeds, and of what is known as the improved Lincoln tup, threw the best progeny as regards the quality of wool and flavour of mutton. The blackfaced breed of sheep, says Mr Gordon, has always been popular in the central and western counties of Scotland, and even in the counties of Sutherland, Ross, and Inverness, where, about the beginning of the present century, it was almost entirely superseded by the Cheviot breed ; it is again predominant, and has increased greatly since the heavy mortality among sheep stocks during the severe winters of 1859-60, 1878-79, and 1880-81. Mr D. M'Arthur, Elmpark, Helensburgh, a retired sheep farmer, who had long experience in the breeding and rearing of black faced sheep, concurs with the remarks of other gentlemen previously given generally, and adds that by the present laws he does not see how sheep farming could be made to pay better, except by reducing rents and fencing hill pasture. The average yield of wool for three-year-old wethers dipped with grease, is about 7 lbs., that of milk ewes 4 lbs., and that of hoggs 5 lbs. a head. Dipping with about half a pound of grease for each animal costs in all about 5d. a heal. 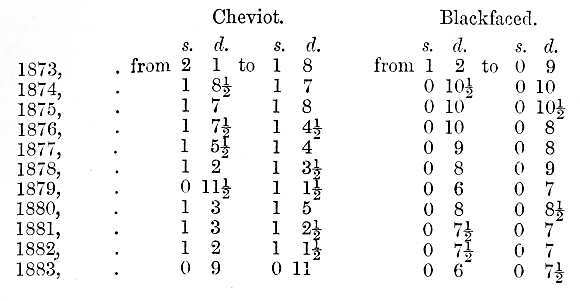 Regarding these lattar two points, Mr Samuel Davidson, manager to Lord Tweedmouth at Guisachan, states that the usual yield of blackfaced wool per animal is 6 lbs. white wool and 8 lbs. laid wool. It is not profitable, says Mr Davidson, to smear sheep, on account of the high price of smearing materials, men's wages, and the low price of laid wool. Smearing costs on an average from 10d. to 1s. per head. Dipping, says Mr Davidson, is preferable to smearing. It has generally to be performed twice a year, each dip costing about 2d. per animal.